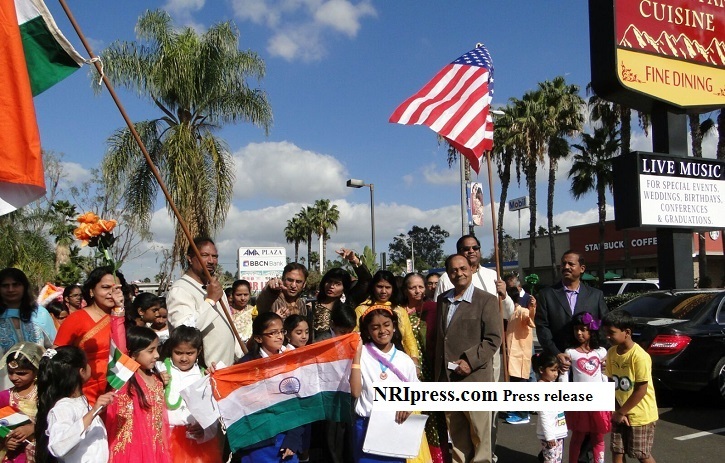 On 24th January, Sunday evening hundreds of NRIs gathered in the heart of Artesia at the Himalayan Restaurant (used to be Haveli Restaurant) to celebrate India's Republic day.The organizers of the event, India Association of So California - IASC decorated the venue ostentatiously with Indian and American flags, balloons, flowers and Indian cultural symbols to reflect the festive atmosphere of this important occasion. 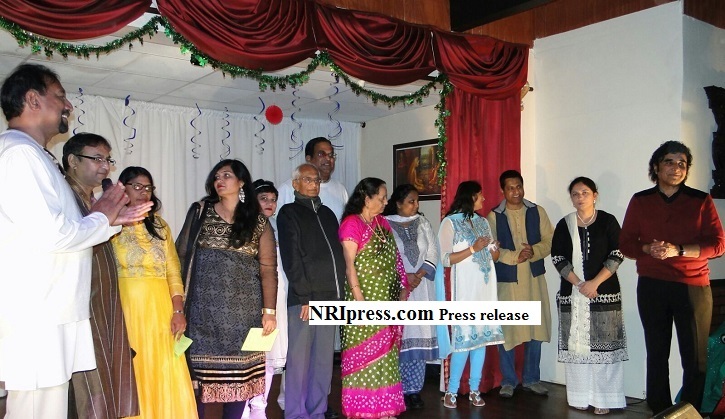 India Association of So California - IASC was founded by Kamini Khare who was not present due to accident in India but all devoted committee members organized great show to celebrate republic Day of India, Atul Makwana, President, event chair women Charu Shivakumar, Sanjay Dighe, Nila Parikh,, Anjana Patel, Chitra Pasi, Ranjit Viswanath , Ravi Viswanath, Sushila Parikh and Dipal joint work brought lot of color full moments. Prior to kicking off the afternoon’s festivities and cultural program, committee members, children and attendees assembled in front of the Restaurant and marched around the Restaurant, proudly waving miniature Indian flags , Pictures of Indian Leaders such as Subash Chandra Bose, Mahatma Gandhi, Bhagat Singh, Sardar Vallabhai Patel, Lal Bhadur Shastri, Azad with slogans of Vante Matram, Bharat Mata ki Jai. After National Anthems of India and USA, By this time patriotic Indian song and glory of Tricolor of Indian Flag has taken over audience jubilation. Atul Makwana, and Charu Shivakumar welcomed the guest, introduced the committee and re define the mission of the organization that is to serve a platform for the community to come together and celebrate the spirit of being Indian and to give opportunities to the children and adults in the Indian Community to learn and share their vast culture with every one and showcase their talents. Mr. Ramesh Mahajan and Dr. Krishna Reddy spoke about their consistent commitment for ISAC activities for the community and they are proud being associated with IASC. The highlight of the event was the leadership speech by the children about the importance of Republic day, Freedom Fighters, National symbols, significance of the Flag and their Vision for India which ranged from Poverty free India, Clean India, Gender equality and Seeing India as a developed strong nation. Following which the cultural event started with a variety of performances. Jay Parikh and Meera played the keyboard, Swarit Srivastava, Jasmin Sivakumaran, Kisha Mehta and Dhruti Kulkarni presented the Leadership speach on “Vision for my India” . Agle Janam dance was choreographed by Rachana Srivastava and presented by Anviksha Srivastava, Shubhita Verma, Fiza Haroon, Shreeya Kakumanu and Dhruti Kulkarni. Odissi dance was choreographed by Ms. Saranagi and performers were Veda Nayar, Shivangi Mohapatra, Srikriti Cherkupally, Shubhamgi Waldiya, Sanjana Ganti. Aaj Ki Party dance was choreographed by Mrs. Sunaja and Performed by Jasmin Sivakumaran, Meera Parikh, Kisha Mehta, Aditi Lakshman, Aadhna Mehta and Diya Lakshman. Bharatnatyam was choreographed by Mrs. Pavithra Krishnan and performed by Prisha Girish, Ketki Mahurkar, Harini Girish, Kaushika Kotagiri, Tania Sunkara and Srikirti Cherkupally. Vante Matram was performed by Swarit Srivastava, Anviksha Srivastava and Shubhita Verma. Quwwali was perfrmed by Swarit srivastava, Ikshan Kaundal, Aryan Haroon Mahasvin m.s. Palak Tandan and Rijul Garg. Achamillai/Indiawale dance was choreographed by Mrs. Rachana and performed by Aashi Hatri, Simran Subramanian, Nidhi Alle, Swarit Srivastava, Jasmin Sivakumaran, Dhruti Kulkarni, Kashvi Prasad and Sachi Gupta. Rang De Basant and Indiawale dance was performed by Sherry, Isha, Anjana, Souhita, Mukta, Rakshana and Jia. The Dance schools and the teachers were recognized on stage and momentous sponsored by Jasmin Human Services were distributed by our Guests Mr. Mahajan, Dr. Reddy , Ravji Bhai Patel and Dr. Shah. The event concluded with delicious lunch and Vote of Thanks.